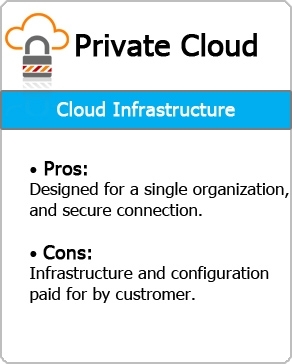 ﻿ Private Cloud Deployment-What is a Private Cloud? Private Cloud is a cloud infrastructure operated solely for a single organization, whether managed internally or by a third-party. Location- Can be located anywhere, but under normal circumstances is housed within the actual business. Security- Unlike Public Cloud there is an increased level of security since this cloud service can only be accessed by designated people. Flexibility- Private Cloud can be tailored to the structure of a given business that requires industry specific compliances and can be hosted internally or externally. This cloud solution has attracted some criticism because the client is still required to buy, build, and manage this type of cloud model. OC Cloud9 can host and manage this type of infrastructure, allowing the client to run their company while we manage their Private Cloud. Benefits of this model include security and the custom design for the client.